Mr. V Laxmikanth, Managing Director, Broadridge Financial Solutions (India) Pvt. Ltd., in his inaugural address, briefed about some of the critical challenges that the corporate leadership is facing due to the clout of information. “The most important challenge is that the time you are allowed to make a decision has drastically come down”, he said. Mr. Laxmikanth also opined that yet another important challenge faced by the corporate is that we generally do not know who the competitors are, which he calls it as the ‘buffet problem’. “The problem gets even more complicated due to the moving buffet”, he adds. Mr. laxmikanth shares his views on what the HR professionals must do to manage efficiency in decision making in the age of information technology and how to balance between centralization and de-centralization of decision making. Dr. Debashis Chatterjee, Professor, IIM Lucknow, in his keynote address, talked about various aspects of human behavior and emphasized that people must have a ‘growth mindset’, which focuses on efforts and not outcomes, as against ‘fixed mindset’, which changes only with lot of resistance. “People with fixed mindset are more prone to corruption”, he said. Dr. Chatterjee urges the HR fraternity that they must pay equal attention to ‘potential’ of the people and not just bank on ‘performance’. “The measures of performance changes drastically with equal attention to potential”, he said. The IIM Lucknow professor also emphasizes that there is a need to adapt to change, which would need constant rebooting and re-learning. Earlier in his welcome remarks, Mr. Pradeep Dhobale, Past Chairman, CII Andhra Pradesh (Erstwhile) & Past Chief Executive, ITC Ltd. PSPD, mentioned that the quality of human resources, in terms of their skills, knowledge, training, experience, flexibility, adaptability and insights is what determines the value of this resource class”, he said. 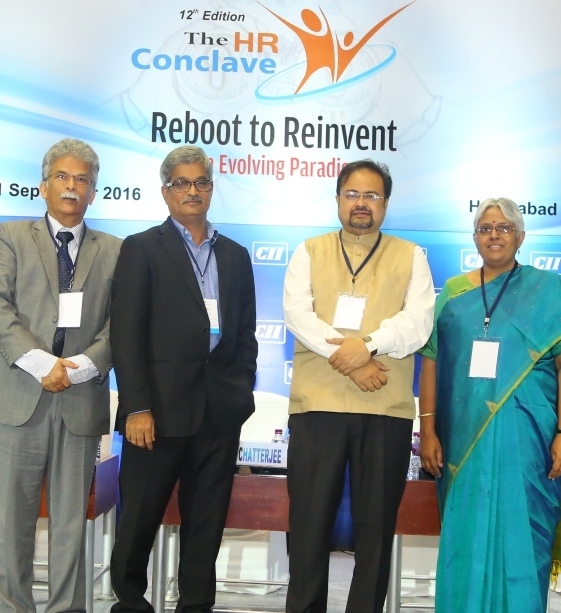 Ms. Uma Devaguptapu, Convenor, CII Telangana HR & IR Panel and Director, HR, Signode Asiapac & MEA, in her vote of thanks urged the professionals to shift from ‘what you wanted to be’ to ‘how you want to be’. The conclave was attended by around 200 HR professionals representing various sectors. Some of the other prominent speakers who shared their perspectives are –Mr. K Srinivas Rao, Chief Strategist & Partner, The Strategist;Mr. Mir Faisal Uddin, Sr. VP & Business Leader – India, Synchrony Financial;SV Nathan, Director, Deloitte Haskins Sells; Mr. Deenanath Harapanahalli, Founder & CEO, Cykul; Mr. Venkatesh Palabatla, Chief HR Officer, GMR Hyd Intl. Airport; besides many others.